10 top rated essential oils for women - Essential oils REVIEW! 10 top rated essential oils for women – Essential oils REVIEW! Essential oils are found all around us in nature. They have been used by various cultures for health and medicinal purposes because of their stimulating, antidepressant, antiviral, antibacterial, detoxifying and calming properties. Essential oils are commonly extracted from natural plant parts including the leaves, flowers, roots, bark, resin, and peels. A process of distillation to separate water-based compounds and oil of a plant by steaming is carried out. Hence, these powerful oils are highly concentrated oils and have a strong aroma. They are also called volatile aromatic oils owing to their high concentration of the aromatic compounds. Having a vast range of uses and benefits including household cleaning products, aromatherapy, medicinal treatments and personal beauty and care, essential oils for women have made a world of difference in their lives and health since forever. So, here are the 10 top rated essential oils for women! doTERRA is a multi-level marketing company that produces high-quality essential oils. Not only does it source its ingredients from around the world but also has its own therapeutic grade protocol to ensure the purity of each batch of oils that it produces. While these oils are a bit pricey, the quality makes them worth it. Lavender Essential oil is extremely useful for reducing stress, calming your nerves, helps with sleeping problems and aids with soothing minor skin irritations. It can be used by adding it to your baths, diffusing it aromatically before bedtime and applying it to the soles of your feet before bed to help you relax and relieve your stress. NOW Foods produces supplements and affordable quality essential oils. Their oils are tested both in-house and by third parties and some of them are even USDA-certified organic. Its 4-ounce bottle of Eucalyptus essential oil is a complete steal for the quality and price when compared to other companies offering the same quantity. The 100% pure and natural oil, made from steam-distilled leaves and branches of the Eucalyptus Globulus tree, has extraordinary benefits as it is anti-inflammatory, decongestant, disinfectant, antibacterial, stimulant, antispasmodic, deodorant, antiseptic, insecticide and many more! It is an amazing remedy for respiratory infections, nourishes skin, hair, and scalp, soothes minor infections, aids in household cleaning, reduces arthritis inflammation and joint and muscle pain and even helps reduce stress. The Peppermint Essential Oil is another great product from NOW and comes in both 16-ounce and 4-ounce bottles. This certified pure oil can be used for cooking, diffused or applied to the skin topically. It can be used to cure a number of problems like muscles aches, low energy, seasonal allergy symptoms, digestive complaints and improves both skin and hair health. Mountain Rose Herbs is a company that sells certified organic essential oils. Made from steam-distilled rosemary flowers harvested in Spain, the Rosemary Essential Oil has anti-inflammatory, antiseptic, anti-fungal, anti-bacterial, disinfectant, antioxidant, and decongestant properties which reduces hair loss, soothes inflammation, improves memory, reduces pains in the liver area, eliminates headaches, relieves fatigue and stress, strengthens the immune system, supports respiratory function. It can be diluted and used topically or diffused. The Mountain Rose Herbs Tea Tree Essential Oil comes from Kenya. While tea tree Essential Oil isn’t the most appealing scent for diffusing unless it’s blended with other oils, when diluted with a carrier oil and applied topically, this miracle oil proves to be an all-rounder in caring for skin, hair and nail health. Its antibacterial properties fight infections and speed up healing while nourishing and hydrating your skin, scalp, and cuticles. 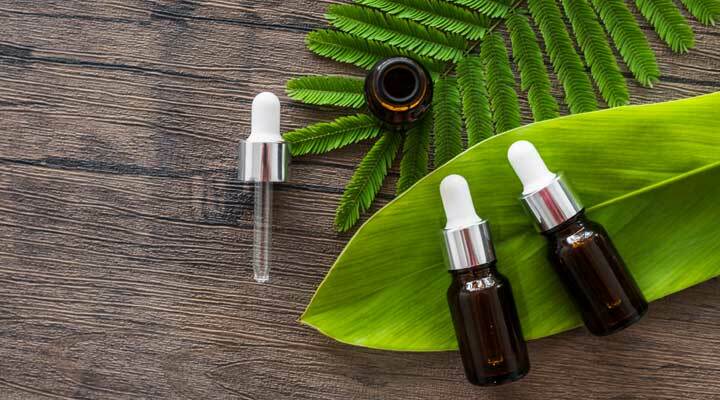 Plant Therapy oils sell a wide assortment of oils including inexpensive starter kits and organic-only ones and their products have been tested for purity by third parties, all the testing results of which are available on Plant Therapy’s website. Its USDA-certified organic lemon essential oil has energizing and de-stressing properties, improves hair, scalp and nail health, helps resolve minor infections, may be used as a skin toner for oily skin for deep cleansing and shrinking pores to prevent acne, relieves nausea, improves digestion, and helps in household cleaning. It can be applied topically, consumed or diffused. This 100% pure USDA-certified organic Frankincense Carteri Essential Oil from Plant Therapy is steam-distilled from the gum resin of the Boswellia Carteri tree harvested in Somalia. This healing and calming oil relieves joint pain, improves memory, helps balance hormones and improve fertility, eases digestion, aids in sleeping, helps reverse signs of aging, and brings comfort in times of grief. This oil can be ingested, diffused or used topically. This 100% pure USDA-certified organic sweet orange essential oil from Plant Therapy has anti-inflammatory, antispasmodic, antidepressant, carminative, antiseptic, aphrodisiac, sedative, diuretic, tonic and cholagogic properties and has a variety of domestic, industrial, and medicinal uses. It helps treat spasms, aids in sleeping, relieves inflammation, prevents infections, boosts immunity, serves as a detoxifier, acts as a mood lifter and relieves depression. Young Living, a well-established multi-level marketing company, is one of the most popular brands of essential oils in the United States and has its own therapeutic grade control process that oversees the entire production of their oils. The Thieves Essential Oil is a powerful blend of lemon, clove, eucalyptus, cinnamon bark and rosemary oils and hence offers the best benefits of all these essential oils. The magical concoction prevents infections, promotes healing, relieves headaches, helps treat pain where pharynx is located, helps in household cleaning, relieves inflammation and pain, relieves allergy symptoms, improves skin health, acts as an antiseptic and even prevents cavities, making it one of best essential oils for women of all time. Like other essential oils from Plant Therapy, this oil is also 100% pure fractionated coconut oil and comes in a 16-ounce bottle that will last you a while. Having powerful antioxidant, antimicrobial, antifungal, anti-inflammatory, analgesic properties, it commonly helps in healing and nourishing skin and hair, reducing inflammation, preventing and treating infections and energizes and stabilizes your mind and is hence one of the best essential oils for women. It can be diffused, massaged topically or consumed. Store these essential oils in dark colored square storage bottles to preserve them for a longer time. They are not only great for self-use but can also make amazing thank you gifts. Jessica is an avid reader who enjoys getting lost in the world of books. She co-authored Supercharge Organic Traffic: A popular course focusing on Organic Traffic for E-commerce.